Brandon Miller, Cha'iel Johnson, Tyrese Cooper, Athing Mu, and many more of the top names in age-group classifications were in action Monday on the track at the AAU Junior Olympic Games in Des Moines, Iowa. All advanced on to finals and semifinals, with strong showings in their events setting up some very interesting finals where fast times are inevitable. Here are some of the highlights from the third day of competition! With the aforementioned big names, there were plenty to choose from. Tyrese Cooper ran a quick qualifying time in the 100m prelims of 10.50, but he ceded some of the spotlight as a result of an outstanding run by Elijha Johnson of Milwaukee, Wisconsin, who bested Cooper out-of-nowhere by a hundredth of a second. As a result, the undisputed star of the show today was Tavares Duckett III of Grand Prairie, Texas. 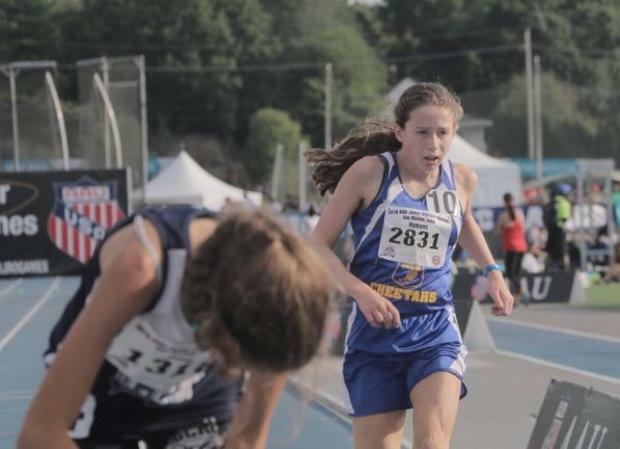 The 12-year-old broke the AAU national record age group record, running 11.67 in the opening heats of the 100m. The mark took .04 seconds off the old record and he still has two more rounds to run. Athing Mu got the crowd fired up with her first round 800m of 2:10.60. Along with Brandon Miller's 1:52, Cha'iel Johnson's 2:14 and Krianne McBride's 2:16, it was a fast day for 800m running. In the final jump of his high school career, Darius Scott knew he'd landed a big one. "Wooo, that was nice," Scott remembers thinking before he even saw the measurement. When the distance came up, though, Scott was overwhelmed with emotion. The mark of 50-06.25 was a personal best by over 1.5 feet, the perfect end to the Cornell-bound jumpers career.